Hazard: The guards on some of these angle grinders will not fully cover a hubbed grinding wheel. As a result, if the hubbed grinding wheel comes apart during use, it could hit the user, possibly causing serious personal injury. Incident/Injuries: Makita has not received any reports of incidents or injury. The grinder's housing is blue and the name "Makita" appears in large white letters on the housing. No other Makita grinders are involved in the recall. Sold at: Industrial suppliers and home centers from about July 2005 through September 2005 for about $179. 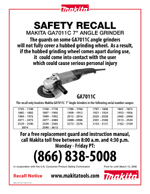 Remedy: Consumers with these angle grinders should stop using them with a hubbed grinding wheel immediately and contact Makita to arrange for a replacement of their guard free of charge. Known purchasers were sent direct mail notification of this recall. Consumer Contact: For more information, call Makita toll-free at (866) 838-5008 between 8 a.m. and 4:30 p.m. PT Monday through Friday, or visit their Web site at www.makitatools.com.